First, they weren't lying about the jump from a levels to first year as I've been given so much work and reading to do already but I think it's nice to get back into academic stuff after 3 months off, I'm not going to lie that writing was a bit weird at the start of the week after I haven't really written anything in so long. So far, I'm finding my modules interesting and I'm looking forward to learning more about different parts of psychology while hopefully finally understanding statistics at some point, I definitely forgot how bad I am at maths over summer! My course is so big and it is so strange being in such large lecture theatres compared to my classes of about fifteen people during A Levels. I'm starting to talk to more people on my course which is good but I still have that anxiety of oh my god what if one day I'm asked to talk in front of all 250 of these people?! I also joined psychology society so it'll be good to get to know people from my course outside of an academic setting and actually get outside and do things. 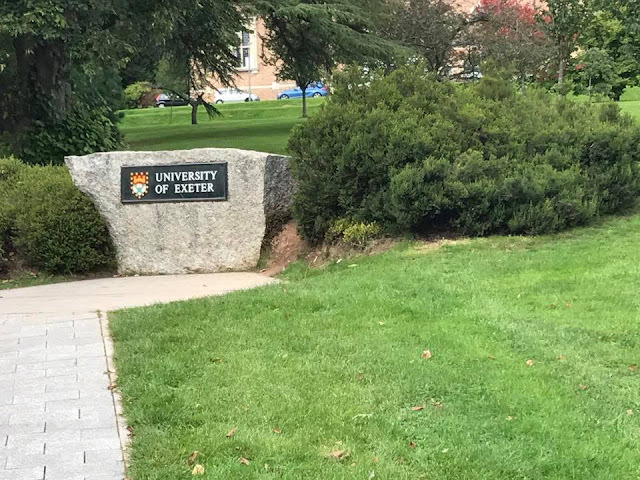 I recently spoke about joining societies and I also decided to sign up for the Exeter Student Volunteers programme where I am hopefully going to start mentoring younger people in secondary schools in the upcoming weeks. This will definitely be a rewarding experience and I am glad that I am making the most out of my time at university already rather than just sitting in my room which I guess, is what people expected of me. I just love proving people wrong, it's so refreshing. I also hope to attend more society events next week and develop my skills and interests in things I enjoy. For example, I can't wait to get back into chess again and meet people who too enjoy the game as honestly, in my nearly 19 years of life, I've only found a handful of people who enjoy it. Maybe I should make a scrabble society because anyone who knows me knows that it's my all time favourite. So far, life in Exeter is really good. I've met some lovely people and although the hills are not getting any easier yet, I am trying to convince myself that they will with time. I'm not being very adventurous with my meal choices thus far but maybe I'll start making more complex things soon rather than the trusty chicken tikka masala, who knows? Overall, I look forward to seeing what the rest of this year brings.